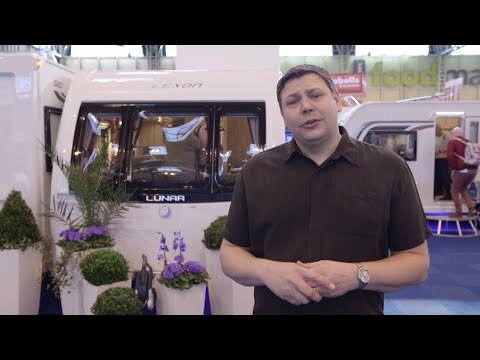 The 2016 Lunar Lexon line-up looks revitalised and Practical Caravan's Andy Jenkinson asks, will the 570’s fixed-twin-bed, rear-washroom layout be a hit? When Lunar launched its Lexon range 21 years ago, its unique selling point was a width of 2.31m. The resulting floorplans made the most of these extra centimetres – and encouraged other manufacturers to try the same tack, which resulted in fierce competition. Wedged between the Quasar and Clubman line-ups, the mid-market Lexon gradually lost some of its following to other brands, including its nearest stablemates in the upper Clubman enclosure. This presented Lunar with a stark choice: drop Lexon or reinvent it. The company chose the latter, and the result is a reinvigorated line-up for 2016. There's more on this in Practical Caravan's preview stories on new caravans for 2016 and the latest new layouts for Venus and Lunar. Here we look at the Lexon 570, a fixed-twin-bed four-berth that comes with the popular full- width rear washroom – ideal for those who frequent simple, five-pitch sites. It is designed to sleep four, but is more likely to be used by couples. With its decent level of specification, the new Lexon should be easy to live with, and its moderate weight will free you from the need to buy a bigger tug. The Lexon is an attractive tourer, with moulded full- height end panels, one-piece aluminium sidewalls and alloy wheels. It’s built on an Al-Ko chassis with an AKS hitch stabiliser and ATC anti- snaking system. The Lexon is a breeze to set up with easy-to-access corner steadies that, surprisingly, are not heavy duty, and sturdy recessed grabhandles. The front gas locker extends the full width of the caravan, and its lid rises clear of the aperture on gas-assisted struts. All the main service points are on the Lexon’s offside, plus there’s exterior access to the space under the fixed beds. There is an external mains socket but not one for gas, so you’ll have to find another way to fuel your barbecue. A Status 530 multidirectional aerial is fitted as standard. Inside, the Lexon has a radical new look. The soft furnishings scheme, which is called ‘Baptiste’, is a far cry from the usual neutral tones. The grey- and-red colourway complements the new large overhead-locker doors finished in Montana oak with gloss-cream centres. The lounge will seat four, and the alarm sensor and tilt sensor are placed in the centre chest’s base. The drawers in that central chest add to the storage, and an occasional table extends from the top. For entertainment, you get a radio/CD player whose speakers are located below the front roof lockers. The contemporary design continues with the illumination, for both night and day. Cubic corner lights contain LEDs, in common with the rooflight surrounds and over-locker arrays. Adjustable spotlights hang from the lockers at the front corners. Lunar has avoided following the crowd by fitting a long ‘Skyview’ rooflight instead of a panoramic skylight. It’s similar to those fitted to Clubman and Delta models last year, but this year’s version is wider. The kitchen, which is opposite the entrance door, is fitted with a separate oven and grill, a dual- fuel hob with three gas burners and an electric hotplate, and an 800W Daewoo microwave oven faced in stainless steel and neatly fitted in its own locker. A Dometic fridge/freezer has a black-panelled door, which blends in well with the rest of the kitchen décor. The grey worktop has a flip-up extension over the sofa to increase food- preparation space. Another design element is the gloss-cream finish to the doors of the overhead lockers and the strip of LEDs along their underside. A mains socket is included and the splashback is new, as is the stainless-steel sink. The kitchen not only looks good, but it is practical, too. Lunar has always produced excellent end washrooms, and the Lexon 570’s is no exception. It’s spacious and practical, with the cassette toilet near the frosted offside window, the handbasin/ vanity unit at the centre of the rear wall, and a fully lined shower cubicle on the nearside. A large mirror and towel ring flank the basin, while the roomy shower boasts an Ecocamel showerhead and its own Mini Heki rooflight for ventilation. The defining feature here is the fixed twin singles, which are lower than those in many rival models to ease access. Each bed has a corner shelf for resting that first morning brew. A fixing point for a TV is mounted on the wardrobe door to make the screen visible from both beds. The front lounge is easily converted into a double bed by pulling the slats from the central chest and arranging the seat cushions in place. The good news for tall folk is that the front double bed measures 2.09m x 1.51m (6ft 10in x 4ft 11in) and the twin single beds are 1.86m x 0.78m (6ft 1in x 2ft 7in). The storage provision is generous for two people and sufficient for four, starting with abundant lockers that are deeper than in previous Lunars. Caravans fitted with panoramic sunroofs normally lack lockers over the front windows, but that doesn’t apply in the Lexon. The lounge also features long doors at the front of the seat benches for unencumbered access to the space inside. As you’d expect, the fixed beds have ample storage below, accessible via long front flaps and outdoor hatches. The wardrobe provides a reasonable amount of hanging space above three roomy drawers. Between it and the entrance is a TV stand with a good-sized, two-shelf cabinet below. The washroom has a cupboard below the basin for toiletries, and shelves in the shower. At a quid under £20,000, the 570 isn’t cheap; if your budget were £2000 less, you could pick up the latest Bailey Pegasus Rimini. However, the Lexon radiates flair; it won’t take long for you to appreciate its smart and contemporary décor. It’s a pity that an Alde central heating system isn’t offered, though.